Matsumoto Katsuharu(39), a financial planner from Matsudo city in Chiba prefecture , is one of those people using brain training for self-improvement. 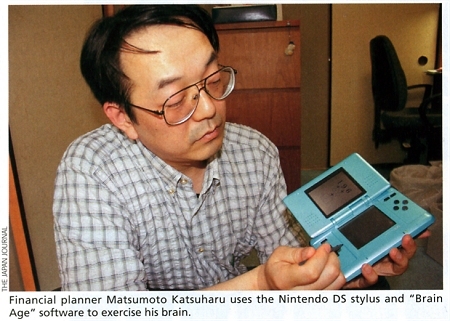 He went to great lengths to get his hands on the Nintendo DS from his local electronics retailer, and started doing brain-training exercises in late April. 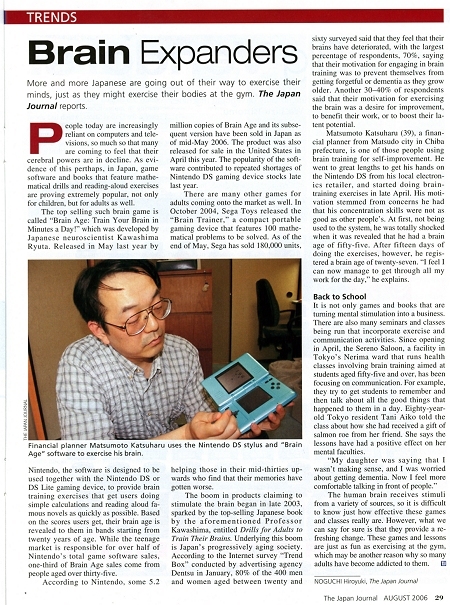 His motivation stemmed from concerns he had that his concentration skills were not as good as other people's. At first,not being used to the system,he was totally shocked when it was revealed that he had a brain age of fifty-five. After fifteen days of doing the exercises, however, he registered a brain age of twenty-seven. "I feel I can now manage to get through all my work for the day," he explains.